I’ve never been too good with brownies. I don’t know why, but maybe it’s the fact that I haven’t once in my life waited for them to cool completely, which always leaves me with a (delicious) mess of gooey crumbs. Okay, so it’s definitely that. 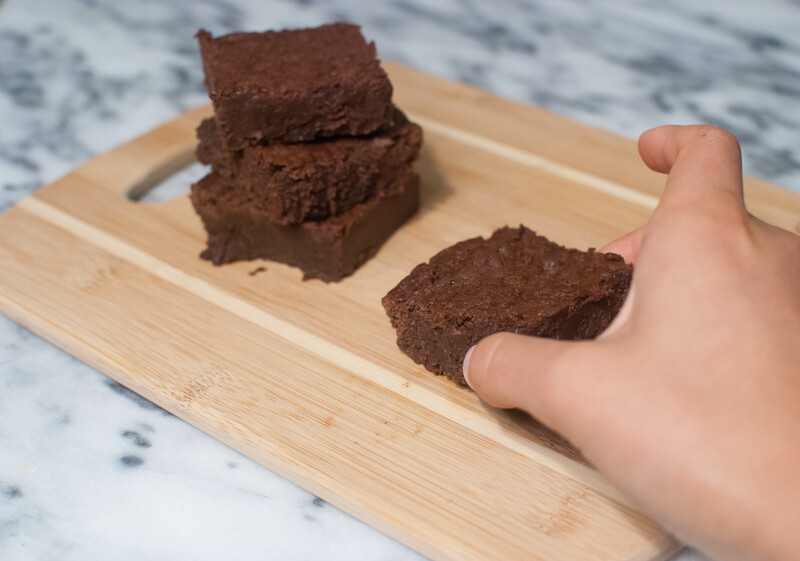 But when I set out to make the famed brownies from Baked NYC‘s cookbook Baked: New Frontiers in Baking, I knew I had to get them right. So I waited patiently as they set, finally placing them in the freezer for a bit as a last resort before my self-restraint dwindled down to nothing. But it was all worth it because these, my friends, are the brownies of my dreams. They are fudgy and rich and chocolatey and so easy to make, you have no excuse but to go whip some up right now. 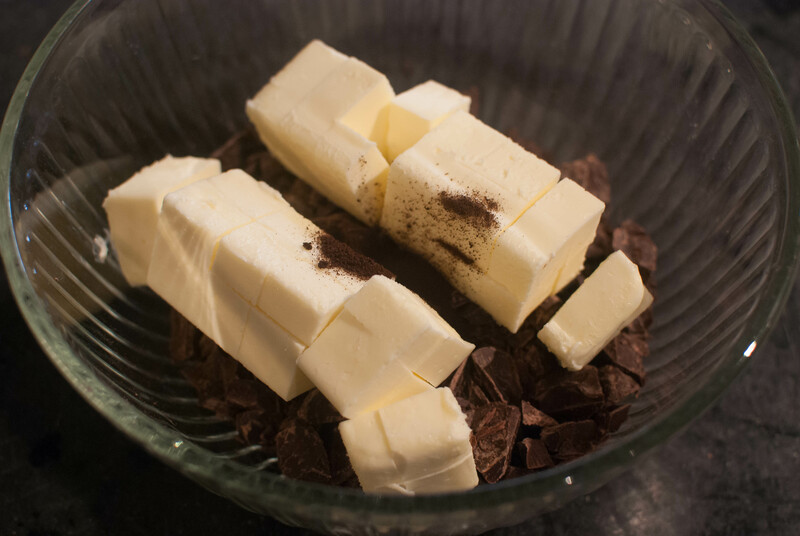 This recipe starts, as any good brownie recipe should, with copious amounts of butter and chocolate. But then it gets hit with a little secret ingredient: instant espresso powder. 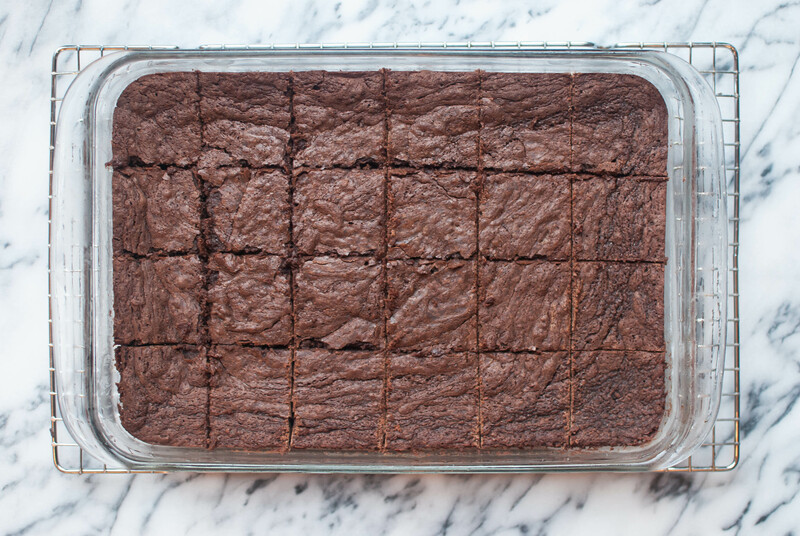 Add it to any chocolate baking recipe and your life will be changed for the better. And coffee-haters, don’t be scared away; this tiny addition just deepens the chocolate flavor without adding a distinctly coffee taste to the dish. Trust me on this one. Place these ingredients in a heat-proof bowl and set it over a pot of simmering water. Let it all melt together, stirring occasionally. In the meantime, whisk together some flour, salt and cocoa powder. When the chocolate mixture is done melting, turn off the heat but keep the bowl over the hot water while you stir in some light brown and white sugar. This should bring your mixture back down to room temperature, so you can take the bowl off the stove and whisk in 3 eggs. Once those are added, go ahead and stir in another 2, then some vanilla. Sprinkle the flour mixture over the chocolate mixture and gently stir it all together using a wooden spoon or a spatula, mixing just until there is barely any flour visible. Pour the batter into a greased 9″ by 13″ pan and bake at 350 F for 30 minutes, rotating the pan halfway through. You’ll know the brownies are done when a toothpick inserted in the middle of the pan comes out with just a few moist bits. Let the brownies cool completely on a wire rack. I know it’s hard! If you want to speed up the process, you can stick ’em in the freezer for a bit. I won’t tell, I promise. Once they’re cool, you can slice them into squares, or eat the whole pan by yourself (along with a pint of vanilla ice cream, of course). Again, I promise I won’t tell. 1. Preheat the oven to 350 F. Grease a 9×13 inch pan. 2. Place the chocolate, butter and espresso powder in a heat-proof bowl and set it over a pot of simmering water. Let it all melt together, stirring occasionally. In the meantime, whisk together flour, salt and cocoa powder. 3. When the chocolate mixture is done melting, turn off the heat but keep the bowl over the hot water while you stir in both of the sugars. This should bring your mixture back down to room temperature. Take the bowl off the stove and whisk in 3 eggs until smooth. Whisk in the rest of the eggs and the vanilla. 4. Sprinkle the flour mixture over the chocolate mixture and gently stir it all together using a wooden spoon or a spatula, mixing just until there is barely any flour visible. Pour the batter into prepared pan and bake for 30 minutes, rotating the pan halfway through. You’ll know the brownies are done when a toothpick inserted in the middle of the pan comes out with just a few moist bits. 5. Let the brownies cool completely on a wire rack. If you want to speed up the process, you can place them in the freezer for a bit. Once they’re cool, you can slice them into squares and enjoy with a big glass of milk! I love brownies! I’m so bad at waiting for them to cool but I do love gooey Brownies they look fab!